There are 1648 posts in this topic. You are on page 1 of 33. About 3 times a day someone asks whether some cleaner or wax they found covered in dust in the garage is safe for their pinball machine. Then about 30 people will describe an elaborate routine they go through to clean their game. Then a few people will say to "put two coats of Novus on the playfield"
Then someone will suggest "Magic Eraser and Alcohol" is all they use. 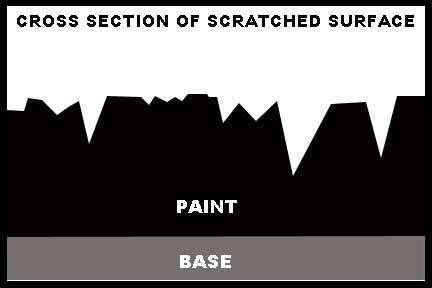 Then someone will mention buying a $100 playfield polishing kit. Here we are going to cut through the BS and get real about what cleaners and waxes actually do when used on a Pinball Machine. Be forewarned, people view their established cleaning routine with an almost religious fanaticism. Toes might get stepped on. Defense mechanisms will be on high alert and trenches will be dug in. "I've been running this same stop sign every morning for the past 20 years. I've never had an accident or even a ticket. You never have to worry about stop signs." she said. vid1900 last edited this post 2 years ago. An old Classic Bally, Classic Stern, EM, or Williams Sys3-11 will have an Alcohol Soluble lacquer topcoat. A Williams WPC or Modern Stern will have an automotive style clearcoat. 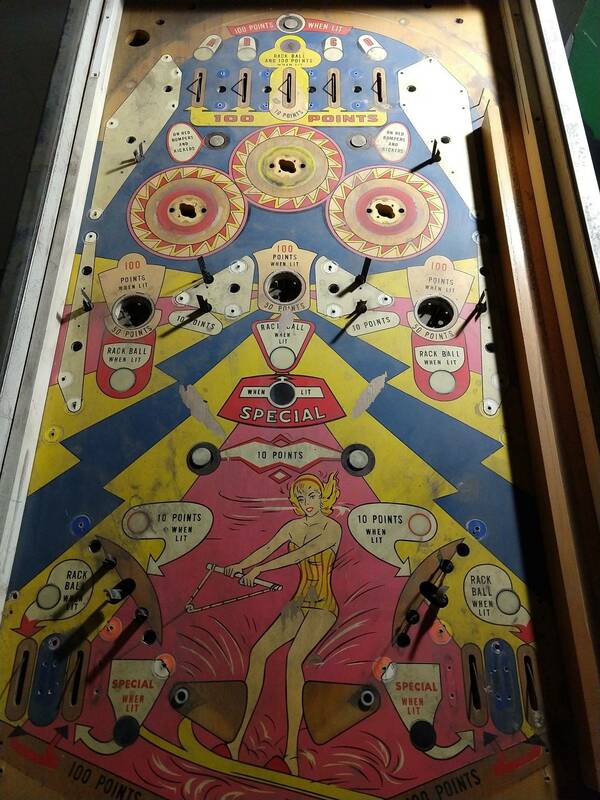 A modern reproduction playfield (like a Mirco or CPR) will have an automotive style clearcoat. 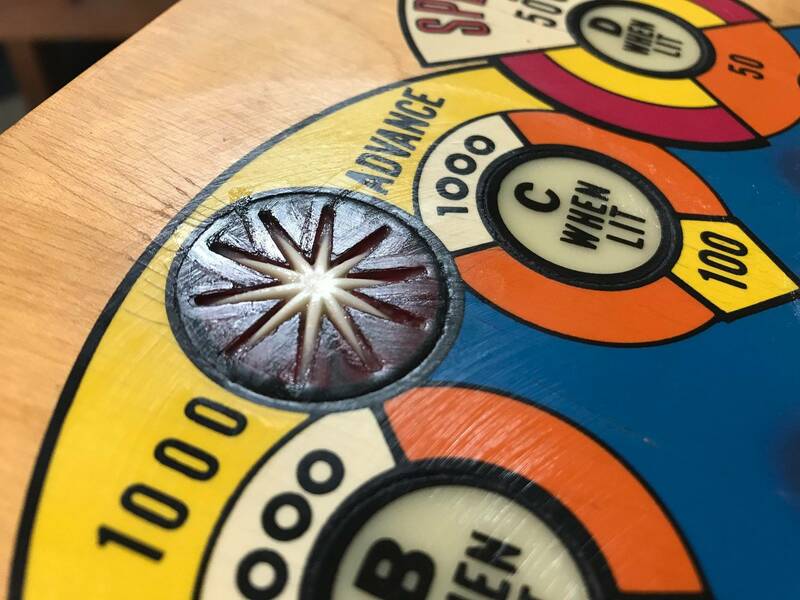 A professionally restored playfield will often have an automotive style clearcoat, although that is certainly not guaranteed. So a cleaner that might be great for a Modern Stern, could actually damage a SS Bally. A cleaner that would be OK for a perfect WPC, might damage a worn or planked WPC. One size doe not fit all when it comes to cleaning a playfield. We also need to remember that at least 5 different companies made the playfields for Bally/Stern/Williams. 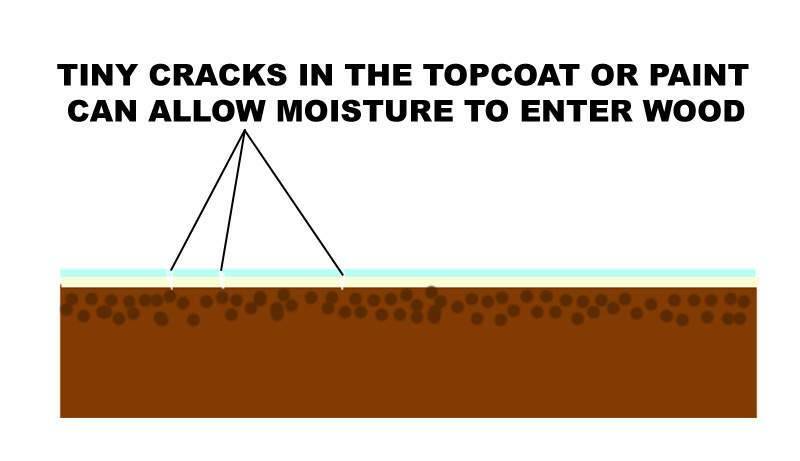 Each may have had differences in the topcoat; thickness, chemical composition and the method of application all could vary. 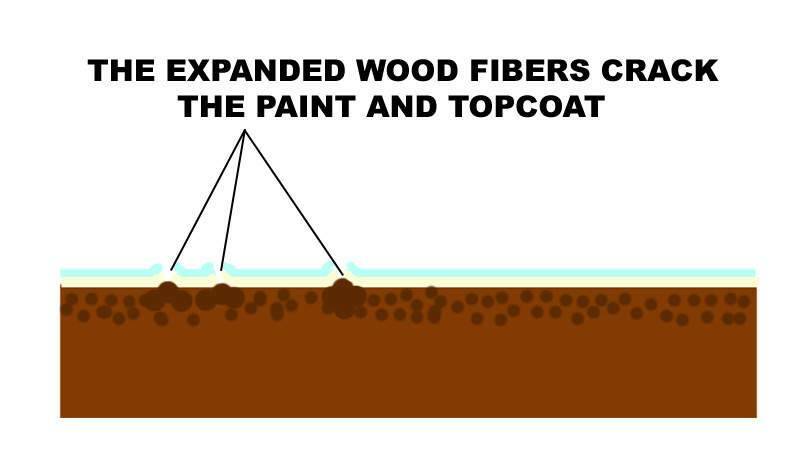 Just because one person has used Novus#2 weekly for the past 25 years without sanding through the paint, does not necessarily mean that you will be able to have the same experience. vid1900 last edited this post 3 years ago. 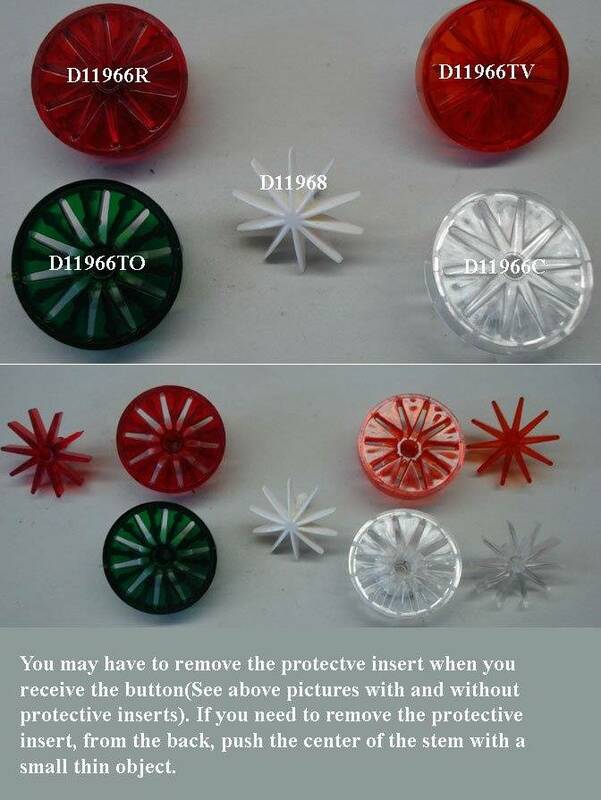 How do you clean ball swirls if not with alcohol and magic eraser on these? On new Sterns & all diamond coats, I swear by this stuff! Warning: Your pin will be Lightning Fast! Let's start with Novus, since they claim that 25% of their sales is to the Pinball industry. What is Novus? It is a series of abrasive polishes, originally formulated for the plastics industry. Yep, I said it; ABRASIVE. 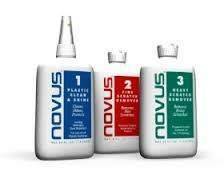 Novus wears down your playfield coatings; Paint, Lacquer or clearcoat. Novus #3 is a very abrasive cream. 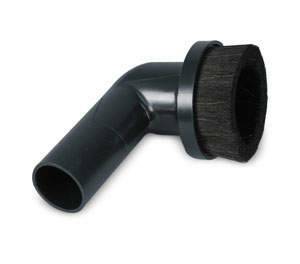 It is used to polish out deep scratches. It is so abrasive, that you need to use Novus #2 to remove all the scratches that #3 creates. This is probably the least used of all the Novus products as far as pinball goes. Novus #2 is an abrasive cream. It is a much finer polish that leaves a really shiny finish on many materials. It does a nice job of polishing out fine scratches. It is NOT a wax. You can't build up layers of it. It does not protect the playfield. Novus #1 is a mixture of alcohol, water and suspended waxes. It's not really a polish (it contains no abrasives), it's more of a cleaner that leaves behind a very slightly waxed surface. It slightly repels dust and fingerprints for a short period of time. I stole these graphics from the old 3-ring binder of Novus Applications under the section about 'can Novus be used on painted surfaces?'. Here we see a layer of paint with deep scratches. You can imagine that it could just as well be clearcoat rather than paint. Here we see that Novus #3 has worn down the paint surface to the deepest scratches; leaving behind a surface of smaller, uniform scratches. Here we see that Novus #2 has removed the scratches that #3 created; leaving us with a nicely polished surface. 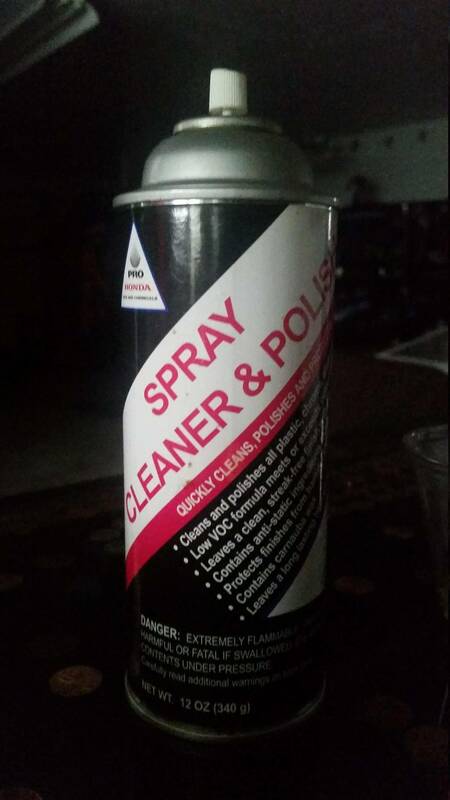 Finally, we see that Novus suggests we protect the polished paint surface with paste wax. 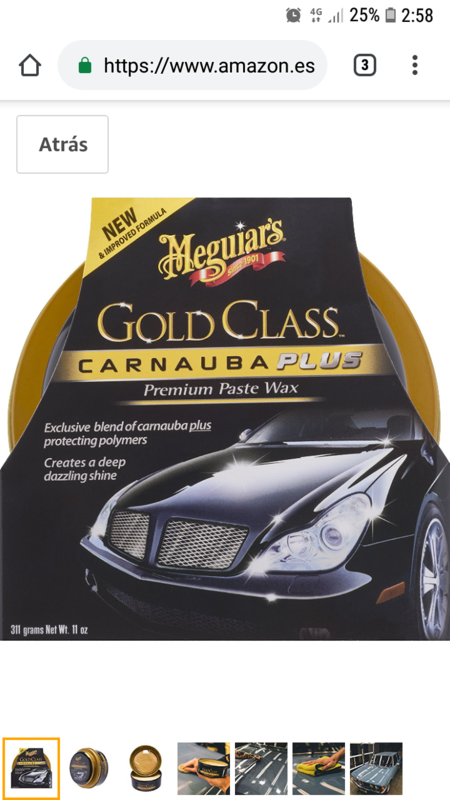 This paste wax fills in the tiny scratches left from the Novus #2, and protects the freshly exposed paint from oxidation and ball wear. So after Novus, we need to apply a coat of wax - note that Novus #2 is NOT A WAX. YOU CAN'T BUILD UP LAYERS OF IT. IT DOES NOT PROTECT THE PLAYFIELD FROM WEAR. Hey vid, I have been using Blitz since you strongly recomended it and it works great! Only problem is how do you get that stubborn lid off that darn plastic container? It gets tighter every time I put it back on. So, we can see that Novus does a great job at removing scratches and leaving behind a polished surface - BUT at the cost of removing a lot of material, be that paint or clearcoat. 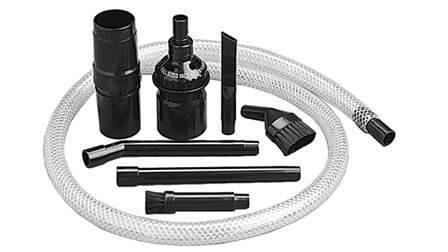 Do we want to use Novus every time we clean? NO! 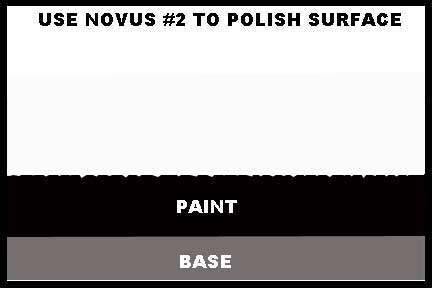 Do we want to use Novus to further polish already polished surfaces? NO! We only want to use Novus to polish scratched surfaces, not as a general cleaner. 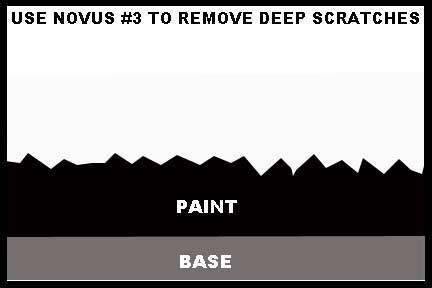 You need to clean the dirt from the surface, before you use Novus2 or 3. Then why does Stern say to use Novus #2 on their playfields? 1. Because the operators most likely already had some. 2. Because it's fast and easy. 3. Because the game was only expected to last a few years. 4. Because the thinking has never been updated to a collector market rather than a routed market. We want to do the LEAST amount of "cleaning" that will leave the game clean. We want to use the LEAST amount of solvent to dissolve whatever grime can't be simply vacuumed up. If you are cooking and get flour on your hands, you don't go out to the garage and scrub your hands with GoJo do you? No, because GoJo is "too much cleaner" for the job when simply rinsing your hands under running water will clean them just fine. Conversely, if you just replaced the bearings on your front end, running water over your hands is not going to remove any of that grease. You need the powerful pumice and solvents in GoJo to clean your skin. First, what are we trying to clean off the playfield? Black coil dust? Little bits of rubber? 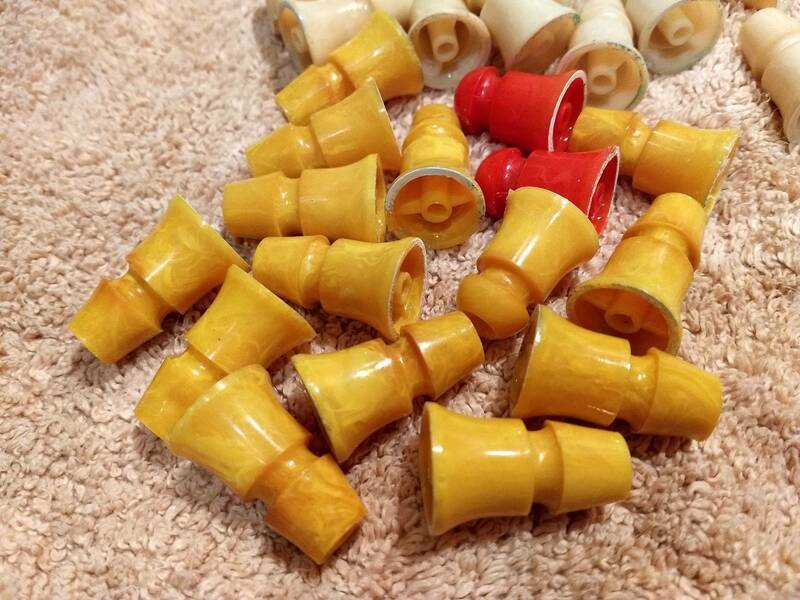 Old wax? 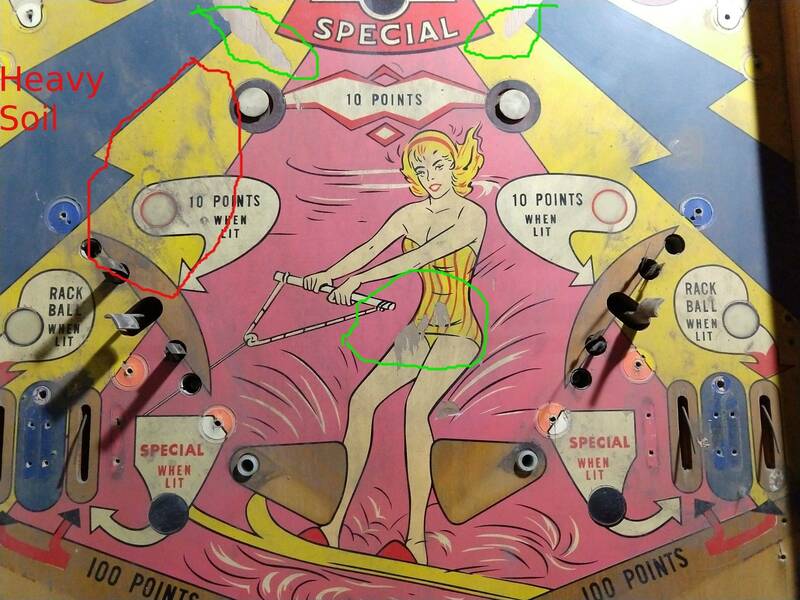 How is the above adhered to the playfield? Just sitting there? Glued down in a sea of dried beer or soda? Your desktop computer tower at home is a good example of something completely filthy, that does not require any Simple Green, soaps or solvents of any kind to clean. Because you don't lube the computer's parts, because it is kept under your desk away from cooking oils and sprays - you take it outside once a year and blast it with canned air. It comes back in completely clean. The fans, the motherboard, the cables; it all looks like new without any solvents or cleaners. 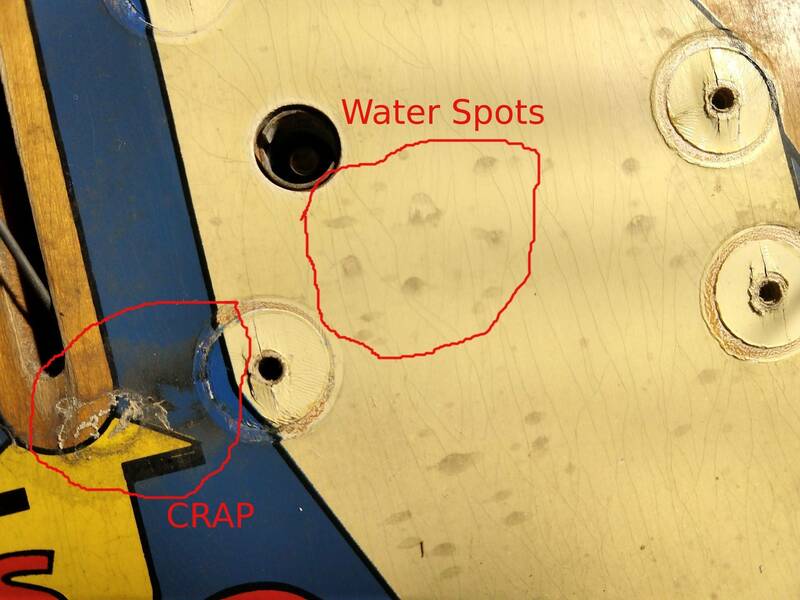 vid1900 your posts are very insightful, ever considered writing a book on pinball repair? I think it would be very popular. WHAT IS ALL THAT DIRT IN MY MACHINE? 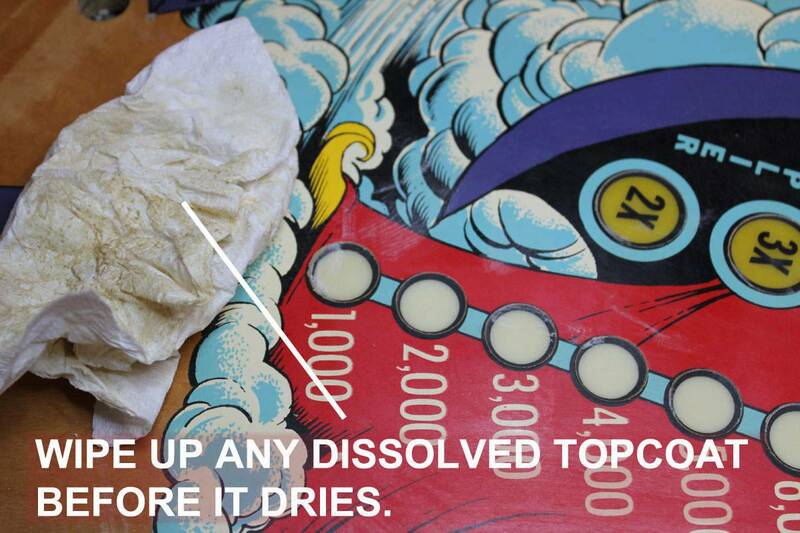 89% of all the dirt in a pinball machine is Coil Dust. The solenoid plunger smashes into the Coil Stop and pulverized metal is the result. You see thicker layers around the flippers and slingshots, and less around seldom used coils. 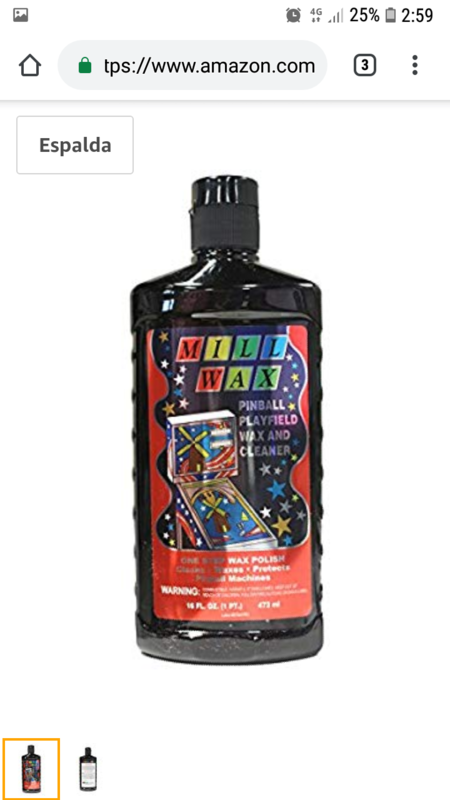 Because we generally don't lubricate solid state pinball machines, there isn't a lot of goo to cause the coil dust to stick to the playfield. Usually vacuuming alone will clean it out. 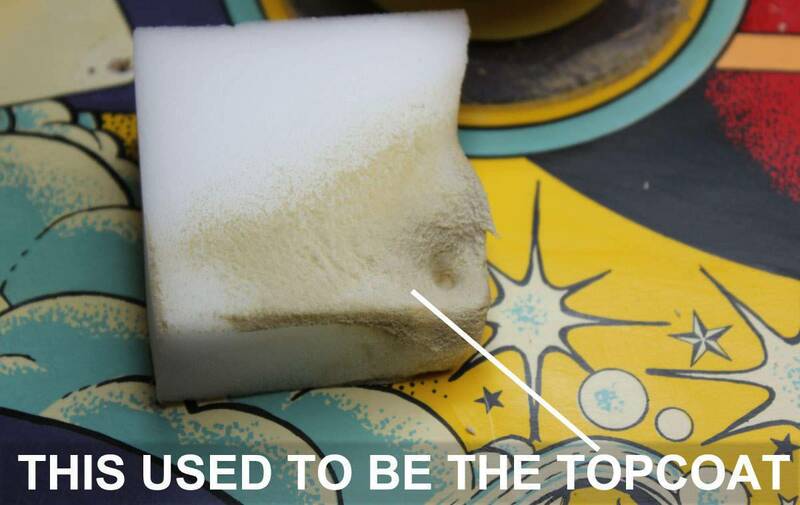 Another 5% of dirt is tiny pieces that wear off the playfield rubbers. Black rubbers make more of a mess than their softer white counterparts. This vacuums up nicely. Maybe 4% of the dirt is composed of worn off plastic, paint and clearcoat. The more nicks the balls accumulate, the more of of their surroundings they wear away as they roll against them. All this dirt vacuums easily. The last 2% of dirt in a pin is simply household dust. You don't get much household dust in a pin because it is passively cooled. No fans draw in dust and filth from the environment. As household dust is composed of 80% dead human skin, it easily can be vacuumed out of the game. We found that 99.999999% of dirt in a pin can simply be vacuumed from the game. We did not need a bunch of cleaners, solvents, sprays or really anything more than a vac and some soft clean rags. I love shopping a machine with original metal coil sleeves. So much more lovely grime. Novus 1 being an abrasive material I don't get why people are using using it monthly on their machines? It looks like you really need a cleaner that is just that a mild cleaner that doesn't harm the PF. Maybe there really isn't a perfect cleaner? Though DILUTED Simple green is a mild cleaner from everything I've read. I don't believe that Novus 1 is abrasive. This is going to be a great thread to follow. Thank you for doing this. Magic Eraser has attained almost mythical status as "the ball swirl eraser" and "the playfield paint eraser". Why does Magic Eraser + Alcohol works great on some playfields, but seems to in a blink of an eye chew through the paint on others? The answer is not a complex one, but first let's talk about what ME is. ME is a Melamine Foam that was used in noise control for years. The fibrous foam is made up of the same Melamine that the Chinese were adding to dog food protein (killing 1000s of dogs in the USA). It has about the same abrasiveness as 1200 grit sandpaper, but its fibrous nature lets it "dig deep" into small cracks and ball swirl. The same way that a natural Sea Sponge cleans much better than a man-made sponge. Magic Eraser + Alcohol works best when the cracks and ball swirls are in the top coat of the playfield AND when the top coat is Alcohol Soluble. You can always test under the apron to see if Alcohol softens the topcoat. 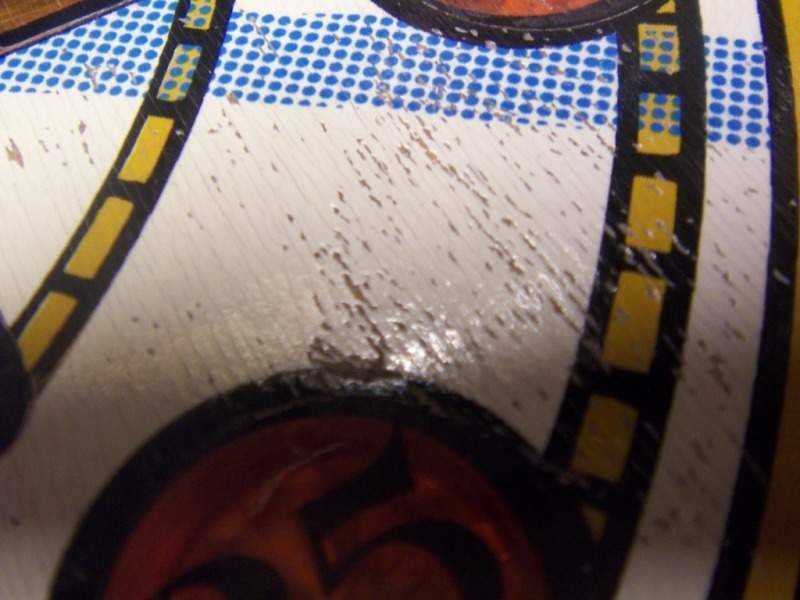 Here we have the usual cracks in the top coat of the playfield. The playfield top coat is Alcohol Soluble (I tested under the apron). Using Magic Eraser + 96% Isopropyl Alcohol (don't use the 50-75% Alcohol, or all that water can raise the grain of the wood), we wet the top coat with a light, quick scrub. Wait 30 seconds for the top coat to soften, and return to give the area a gentle scrubbing. A few seconds of scrubbing, and wow, all the topcoat has been cleaned off, revealing the beautiful virgin paint beneath. This is the old top coat, dissolved and cleaned off the playfield. Use a paper towel and wipe off any dissolved topcoat/melamine slop before the alcohol evaporates. Otherwise the topcoat hardens into lacquer again, and is a mess to clean up. Here the topcoat has been worn off through years of ball travel. So down this ball trail, the ball swirls are in the paint itself, not the topcoat. The Magic Eraser seemed to be cleaning out the swirls in the yellow paint at first, but 2 strokes latter, the Eraser had chewed all the way through. It happens in seconds, no matter how careful or experienced you are, lol. 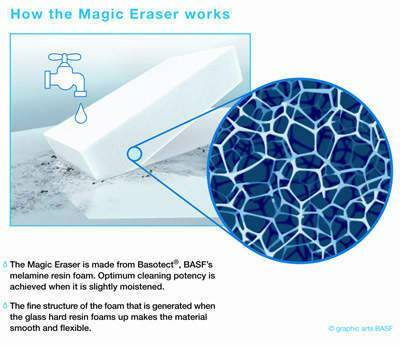 If the Magic Eraser shows ANY paint color at all - STOP THAT VERY INSTANT, there is almost nothing left for you to sand. 1. 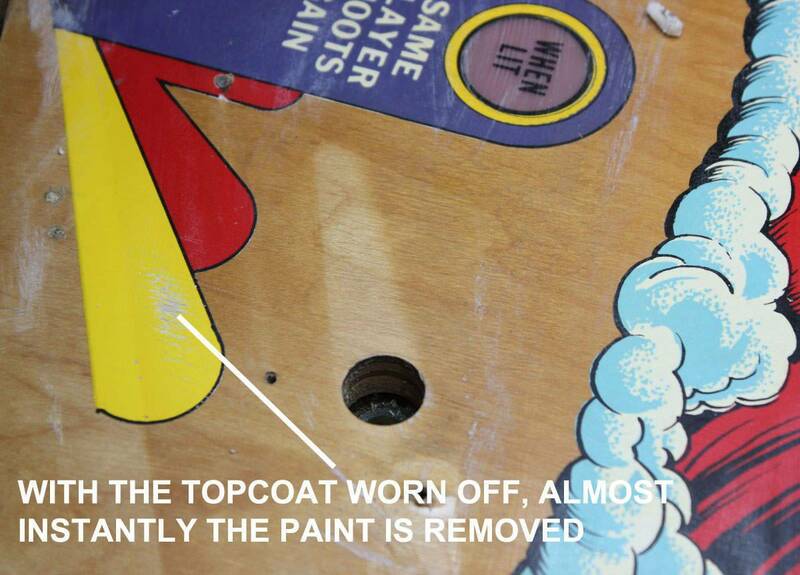 Once we remove the top coat, we HAVE to clear coat the playfield. The paint alone will not last long. 2. 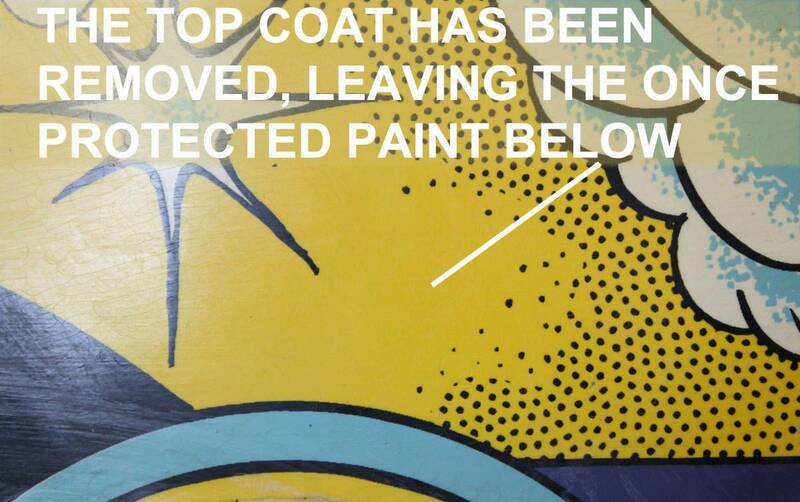 Without the protective top coat, any wear, or ball swirl will be occurring into the paint itself. 3. 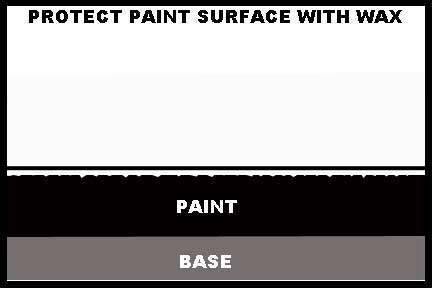 Trying to remove ball swirl from paint, often results in exposing the white primer below. If you see color on the ME, stop! So if you have an old game you want to "clean up" but not clear coat - don't automatically reach for the Magic Eraser. Let the old top coat do it's job, and leave it alone. Thanks for putting this up vid .. seems there was a new topic every other day asking about it . I cringe every time I buy a game from a guy and as I close the deal, he brags about how he routinely "polished" it with Novus. 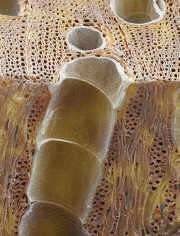 Wood is hygroscopic, which is a fancy way of saying when the cells of wood take on moisture, they expand. 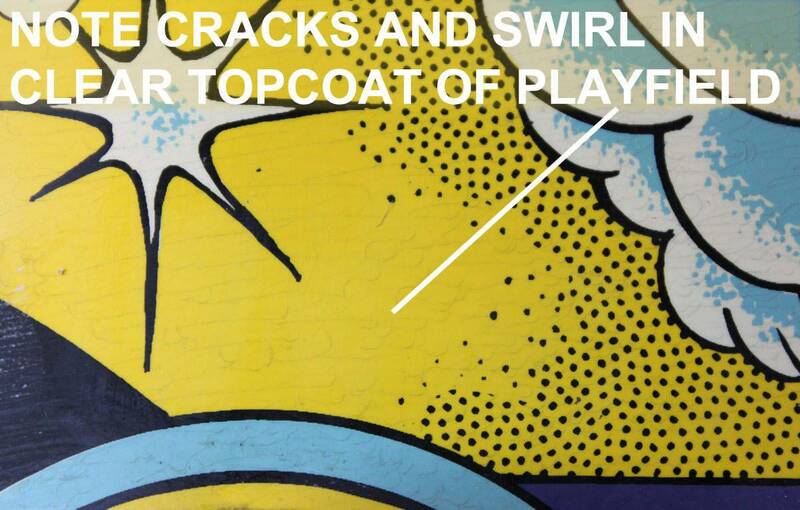 On playfield, that expansion will cause cracking or "Planking" in the painted surfaces. A new playfield is pretty well sealed against moisture, but after 40+ years (especially if it was ever stored in an unconditioned garage), older playfields will have many tiny cracks. If moisture (like a cleaner containing water) soaks through those cracks, the wood fibers will expand over the next few days. This expansion will cause Planking in the paint and clear - and of course, allow more moisture in. So on older playfields, we don't want to be using any water based cleaners. We want to avoid things like Simple Green, Windex, Orange Power.... even Novus #1. Let's define older as any playfield not having an automotive style clearcoat like Classic Bally, Classic Stern, EM, or Williams Sys3-11. Here is an example of a heavily planked Fun House. Even though the Novus #2 has given it a shiny polish, it can't bring back planked paint. So we now know what cleaners to avoid for older games, so what's a good cleaner we can use? It's cheap ($14 a gallon), it removes old wax, it won't swell wood, and it won't remove solid paint or topcoat. 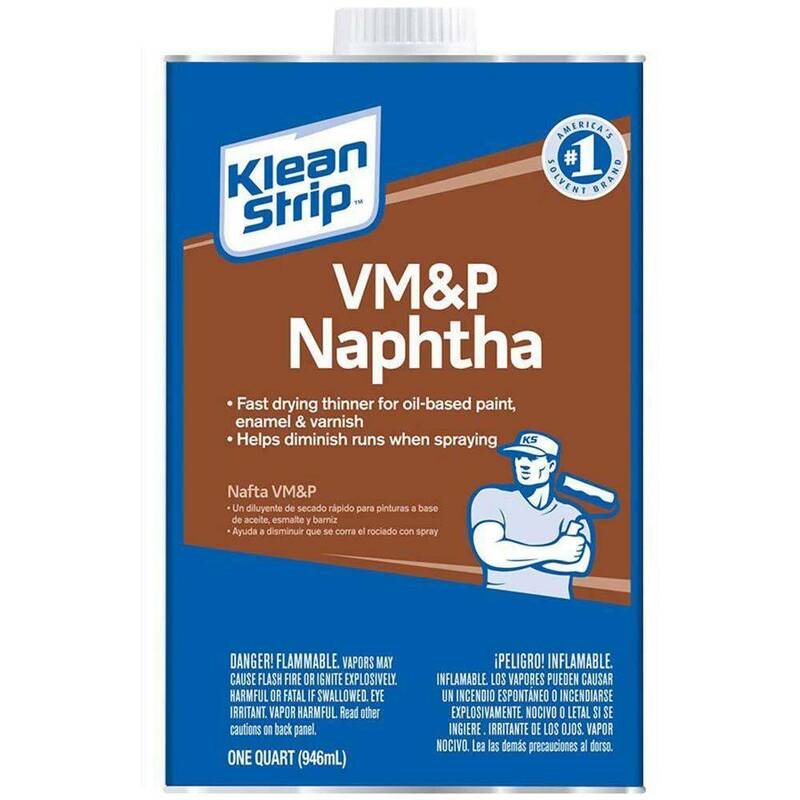 Naphtha is flammable (it's the stuff you use to refill a cigarette lighter), so don't throw dirty rags on the floor next to the hot water heater. Spread the rags out flat and let the Naphtha evaporate until dry. Again, don't "clean" just to have something to do, but wait until you see how black the rag comes back after wiping an old, porous playfield down with Naphtha. vid1900 last edited this post 6 months ago. Vid, can you also recommend how to clean the Mylar on old sys11 games? Is naphtha ok to use on Mylar? Am I being a little to obsessive about the lines? Is this the right way to go about getting rid of these lines? Last, I've been working around cars and body shops for along time, I've got a Spiderman that looks to have just a ton of light clear coat scratches(only visible in bright light) that won't come out with Novus 2 or Novus 3 rubbing by hand. Typically on a car, we use the wool pad, then foam and keep working up to the final wax(wetsanding if necessary). I am completely comfortable buffing a very expensive metal car, but very scared to use a buffer on a pinball. Is there a Technic you would try to get rid of some of this haziness or clear coat scratching that does not involve a buffer. 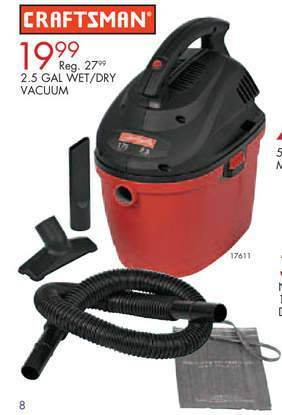 FYI, In case anyone is interested another pinsider turned me on to this mini vac attachment. $10.00 on Amazon and it goes on most vacuums. Honestly, just scrape the warm wax into a glass jar and be done with it. 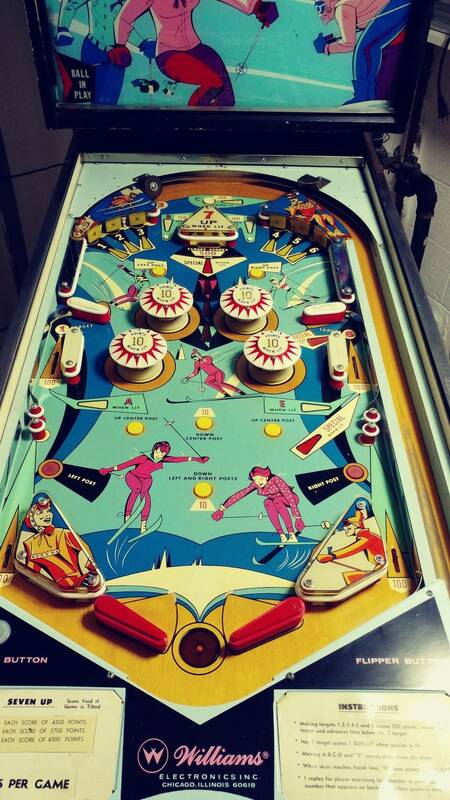 You can, of course, use Novus #2 on a modern Stern playfield to remove fine scratches and ball trails. But the instructions in some Stern manuals instructing you to "wax with Novus #2" are hilarious. I'm not sure people still buy books. I'd probably spend a bunch of time writing it and it would be pirated on KAT.cr and alt.binary.ebook in 2 days, like all of Clay's guides, Pinball Arcade, and everything else, lol. Naphtha is fine to clean Mylar (try not to get it under the Mylar). If you want to POLISH Mylar you need a high speed buffer. Thanks for the instructions, I have always been cautios, and although I have both Novus 1 and 2 (a pita to find in Europe and further pain to ship to a non-EU country of mine) I mostly use just Novus 1. Seeing the gooey consistency of Novu2 I always suspected it is abrasive and contrary to all advice so far refrain from using it if it didn't show immediate results and it never did. Thus, off course, I have never actually erased any ball swirls. 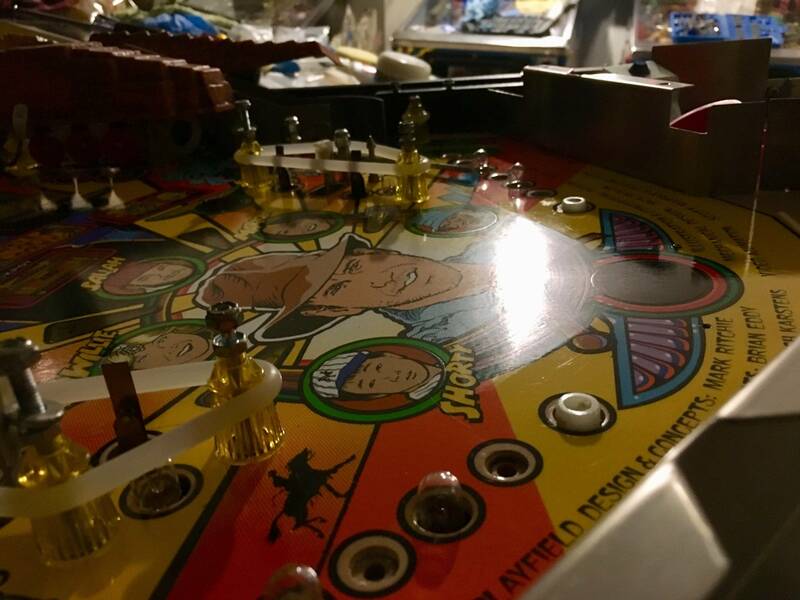 What would you recommend for a best, most efficient and mos safe way of getting rid of ball swirls on a '95 Shadow playfield without having to clearcoat it after? The lines made by the pinballs down in the in and out-lanes and orbit drive me nuts. I always worry that If I don't stay after them, they will end up being permanent. It's true, if you don't keep them waxed, the "ball trails" will become permanent. I'd ask your therapist at the next session. You can wax the inlanes and then put down Mylar to protect from any further wear. As long as you wax first, the Mylar will be easy to remove latter. I am completely comfortable buffing a very expensive metal car, but very scared to use a buffer on a pinball. Yeah, it can be scary the first time. But once you do it, it is a very liberating experience. Using a mini buffer, practice under the apron. You will quickly see how good you can do. Let's see a good picture of your ball swirls. ok, thanks, If we're still talking about ball swirls on a playfield I'll take a picture when I get home. It's dark trails on orbits and inlanes that don't go away with any amount of time or pressure with microfiber cloth and Novus. Is alcohol and microfiber cloths going to give you less abrasion than an ME? I'm apprehensive when it comes to using the ME due to the abrasive qualities and I've been using the microfiber cloth instead to great effect before putting down a wax. 45 year old EMs don't have much top coat left to start with. It's pretty worn. So I'm not sweating it. ME and alcohol and Novus 2 followed by wax work absolutely fine, without a new clearcoat. Here we go!!! Another awesome Vid guide. Thank you sir!! Naphtha is fine to clean Mylar. I'm finishing up my first pin restoration. I went with the overlay approach for the new playfield artwork and did not opt to clear coat it. The surface of the overlay isn't quite as glossy as I had hoped. I put down two layers of Mothers Carnauba Wax on it, "buffing" it out by hand with microfiber rags, and it improved marginally but still not ideal. Would you say then that if I used a mini high speed buffer with the wax that I would get a more polished result? Thanks for putting this together. 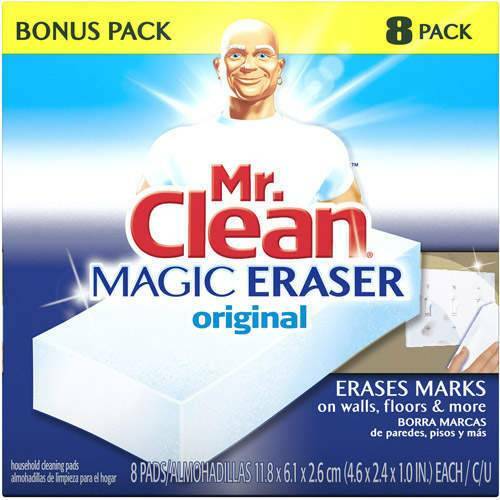 I really want to get rid of ball swirls in on early SS games, will naphta and magic eraser be a better alternative than alcohol and magic eraser?